Gone are the days of Tests being taken on paper. Most Exams are now taken online - some in a supervised environments, however a lot of Exams are now taken out of the Classroom or Workplace. A popular question we receive here at ClassMarker is "How does ClassMarker prevent cheating with online exams & assessments?" ClassMarker's advanced testing system offers multiple options that you can use in order to help with the prevention of cheating. Now, let's go through the above mentioned ways in detail. This will randomize the order that questions are displayed in, each time the test is taken. 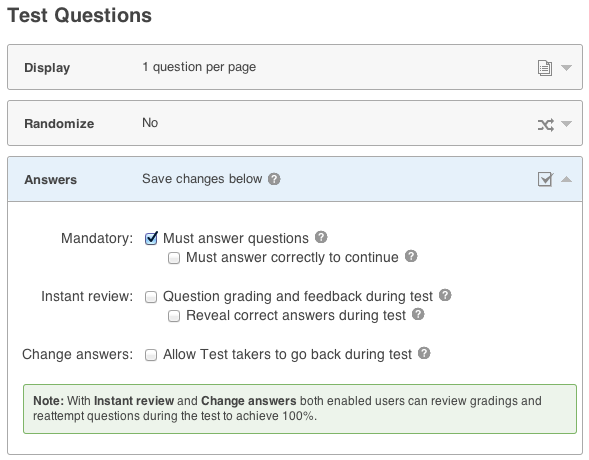 When adding or editing existing questions, you can select to display answers in random order each time the Test is taken. These are questions that are selected from your Question Bank at random each time the Test is taken. Option 1: Choose the total number of questions to be randomly selected from chosen categories. Option 2: Choose the specific number of questions per category to be randomly chosen. 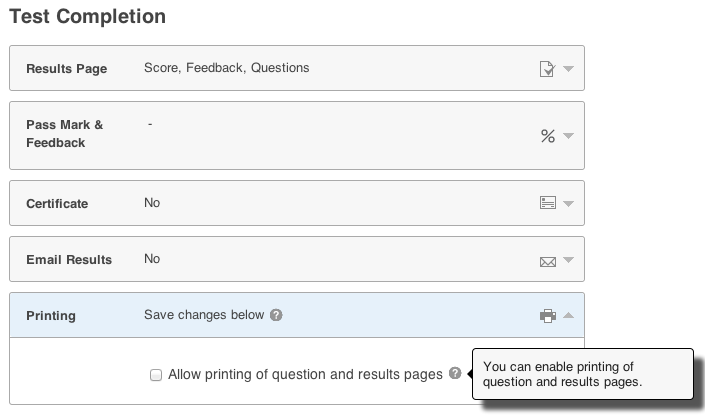 ClassMarker offers the ability to enable printing of the question and results pages for test-takers. You can however disable printing as a preventative cheating measure. Placing a Time Limit on your Test will help to prevent users from going away from their Test to search out answers as they know they only have a certain amount of time to complete their Test. They may not want to waste that time, because if the timer does run out, their Test is considered to be finished. ClassMarker has a feature that will allow test-takers to go back to previous questions in which if this is set, answers can be changed. You can however choose, to prevent users from going back to previous questions once they have submitted those answers. employee training or educators administering online student testing. ClassMarker's advanced cheat prevention features are crucial when giving online tests. Register here and start testing today.